It’s time to take a break... if you feel overworked and stressed out, there’s a good chance that you make up the 36% of people who work through their lunch breaks every day or you are the one person in four that never takes a break during the working day! It’s time to stop, take a deep breath and a step back. Regardless of how much work there is in front of you it’s nearly always a false economy not to take a break because your productivity will fall in the afternoon and you could even increase your chances of an accident due to a lack of concentration. Another problem for some workers are fears over job security and worries that taking breaks could look bad in front of bosses and colleagues. However most forward thinking employers understand the importance of regular breaks and many now insist that workers take time to recharge and invest in creating seasonal recreational areas to help with this. In most cases all it takes is the allocation of a specific area where chairs, tables and other relevant catering equipment can be positioned to encourage people to leave their workstations. Now take a break - you’ve earned it!! An outdoor space can be very useful for any business. It can serve as a staff or customer car park, be used for staff to relax, to welcome visitors and to give a good first impression. However, because it is outside, some companies don’t make the most of this type of space. With a few bright ideas, you can use your outdoor space to enhance your staff’s workday experience. 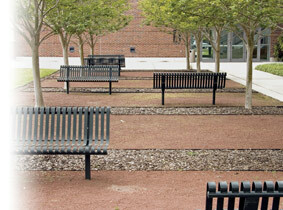 For example, a park bench on a south facing wall can soon become a staff favourite. You should choose your outdoor furniture wisely. It may be tempting to put purely decorative items in your outdoor space, but you should always consider if your furniture can stand up to the elements. Typically, it would be best for outdoor furniture to be made out of wood, metal or recycled plastic. These are highly durable materials that do not get damaged easily. Don’t forget the other elements that make a space work for example, litterbins to collect waste, a canopy or shelter to extend the time it can be used or lighting to give a security dimension in winter.